In a rare occurrence, Space Shuttle orbiters Discovery and Endeavour were purposefully visible together this morning at the Kennedy Space Center as a Shuttle shuffle took place to move Endeavour from OPF-1 to the VAB for storage and Discovery from the VAB to OPF-1 for full Transition and Retirement processing, set to culminate for the veteran orbiter in January 2012 when she will be ready to ferry to the Smithsonian. One month and two days after Space Shuttle orbiter Atlantis lifted off on the finale of the Space Shuttle Program, her two sisters – Discovery and Endeavour – shared the spot light this morning at the Kennedy Space Center in what was a rare-est of rare photographs of the Space Shuttle Program: two Space Shuttle orbiters, on their wheels, nose-to-nose, in severely stripped-down attire. Specifically, the effort to move Discovery and Endeavour was part of the ongoing Transition and Retirement flows for Atlantis (OV-104), Discovery (OV-103), and Endeavour (OV-105) in only two OPFs at the space center. After completing her historic 39th and final mission in March, orbiter Discovery was moved into OPF-2 (Orbiter Processing Facility bay 2) for Down Mission Processing and initial Transition and Retirement (T&R) processing. Interestingly enough, Discovery’s entrance into OPF-2 on March 9, 2011 marked the first time in nearly 10 years that she was placed into OPF-2. The last time Discovery was in that processing bay was on September 18, 2001. After Sept. 18, 2001, Discovery spent several months in storage in the VAB, two months in OPF-3, and then two months in OPF-1 before being stored again in the VAB. After this, she was moved into OPF-3 on August 22, 2002. As fate would have it, OPF-3 would end up being Discovery’s final operational home at the Kennedy Space Center, as the tragic loss of Columbia reduced the Shuttle fleet to three orbiters and allowed each orbiter to gain an OPF all to themselves. In all, Discovery would call OPF-3 home from August 22, 2002 – September 9, 2010 when she was rolled out and over to the VAB to be mated to her ET/SRB flight set for her final mission. During the lengthy launch delays for Discovery on STS-133, the decision was made to terminate OPF-3 operations for the Shuttle Program and prepare the bay for future use by an outside customer. This meant that Discovery had to undergo post-flight processing from STS-133 in OPF-2 since teams were able to move Endeavour over to the VAB for her final mission before Discovery landed for the final time. As such, Discovery spent March, April, May, June, and part of July in OPF-2 undergoing post-flight deservicing and initial T&R processing. 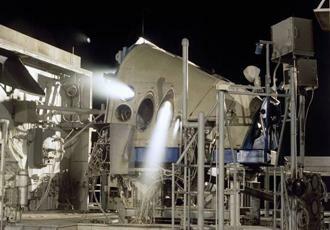 However, the loss of OPF-3 meant that NASA had to contend with only two processing facilities for three orbiters. As such, NASA moved Atlantis out of OPF-1 and over to the VAB for stacking for the final Shuttle mission after the successful launch of Endeavour and STS-134 in mid-May. When Endeavour returned to land at the end of her final mission, she was moved into OPF-1 – an OPF she had not been in since September 30, 2002 when she finished processing for STS-113. Once in OPF-1, Endeavour began Down Mission Processing: engine removal, initial fuel tank drains, Forward Reaction Control System pod removal, and OMS pod removal operations. By mid-July, following the successful and emotional launch of Atlantis and STS-135, Discovery – looking the worse for wear – was removed from OPF-2 and transferred to VAB HB4 for storage in order to make room for Atlantis upon her return from STS-135. On July 21, 2011, Atlantis successfully completed the Space Shuttle Program and was towed into OPF-2 – an OPF she had not been in since September 4, 2002 when she completed processing for STS-112. Once spotted in OPF-2, Atlantis began Down Mission Processing. Following the decision of NASA’s leadership to send Endeavour to Los Angeles and the California Science Center for the youngest orbiter’s retirement, the master and orbiter-specific T&R schedules were changed to reflect the fact that Endeavour would not be staying at the Kennedy Space Center. Nonetheless, T&R documentation never wavered on the fact that Endeavour would be the final Shuttle orbiter to complete T&R processing despite the fact that she was the second-to-last Shuttle orbiter to fly. That all changed as soon as Endeavour’s California destination was announced on April 12, 2011, and T&R documentation was changed to reflect the fact that Endeavour would now be the second orbiter to finish T&R processing. 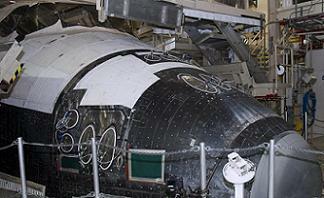 However, Discovery still remained as the vehicle that would be ready for retirement display first. To accomplish this with only two OPFs and three orbiters, NASA was forced to shuffle Endeavour and Discovery following the completion of Down Mission Processing on Endeavour. This move, which was accomplished Thursday morning, involved backing Endeavour out of OPF-1 and stopping her on the tow-way just outside OPF-3. Discovery was then removed from the VAB and towed over to her sister, where a never-before photo op was convened: two Shuttle orbiters, on their wheels, nose-to-nose, stripped down to the bare bones with neither orbiter sporting her FRCS, OMS pods, or Space Shuttle Main Engines. However, while the photo op this morning was unique in many ways, it was not the first time that two Space Shuttle orbiters were photography together, on the ground, in the horizontal position near the OPFs. In fact, at least three of these dual Shuttle photo events (all involving Discovery, no less) occurred over the 30-year, 5 orbiter history of the Shuttle Program. 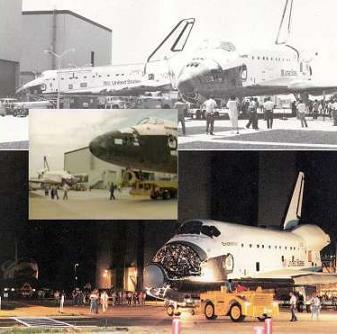 Those three specific events included Discovery and Atlantis switching places (Discovery to OPF-1 and Atlantis to VAB HB2) in May 1986; a mission-ready Discovery being rolled to the VAB for temporary storage on July 25, 1991 as Endeavour waited for her to vacate OPF-1; and Discovery rolling to the VAB for mission stacking as Columbia was moved from VAB HB2 to OPF-1. Moreover, there were several “almost” photo ops in the 1990s as NASA dealt with moving four orbiters between three OPFs. One such occasion occurred on June 8, 1994 when Columbia was rolled over to the VAB for mission stacking. Columbia was secured in the VAB transfer aisle by the time Discovery began moving from VAB HB2 storage into the now-vacant OPF-2. The move today of Discovery into OPF-1 marked the beginning of the end of the road for Discovery. As currently scheduled, Discovery will remain in OPF-1 until teams complete all of her T&R activities and configure her for display at the Smithsonian’s National Air and Space Museum near Washington, D.C. 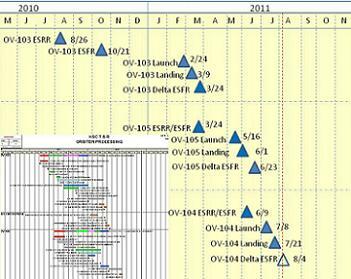 Moreover, a new master T&R schedule – available for download on L2 – has revealed the new and updated timelines for all four Space Shuttle orbiters and their respective retirement and display flows. Counting the work that has already been accomplished, Discovery is well into her T&R processing flow. Following arrival in OPF-1 today, T&R work will pick up in earnest, with museum configuration operations and OV-103/OPF-1 End State Safing operations consuming all of the work on Discovery from August 10 to early November 2011. In mid-October, under the new schedule, crews in OPF-1 will officially power-down the orbiter Discovery for the final time. 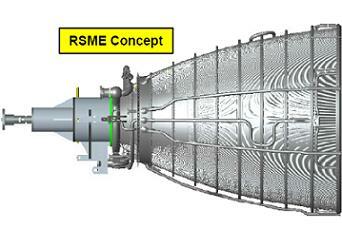 In late-October, installation of her Replica Shuttle Main Engines (RSMEs) will take place, followed by the return of her FRCS and OMS pods from White Sands Space Harbor, NM in early November. At this point, OPF-1 crews will spend November through mid-December installing her FRCS and OMS pods and performing final display ops configurations on Discovery. 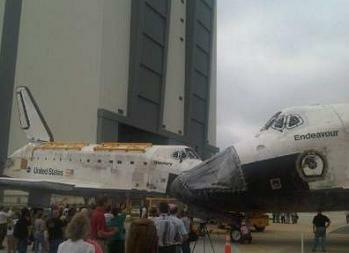 By the holiday break in late-December 2011, Discovery’s processing at the Kennedy Space Center will come to an end. On January 3, 2012, Discovery will be “ready for ferry” – a politically correct way of saying that all work on Discovery at the Kennedy Space Center will be done. On Jan. 3, Discovery will be rolled out of OPF-1 and into VAB HB4 for storage. She will remain in storage until April 10, when she will be towed to the Shuttle Landing Facility (SLF) and hoisted atop the Shuttle Carrier Aircraft (SCA). Then, on a date that seems too conspicuous to be a coincidence, the Space Shuttle orbiter Discovery will depart the Kennedy Space Center for the final time on April 12, 2012 – the 31st anniversary of the very first Space Shuttle launch. After a short flight on the back of the SCA, Discovery will arrive at Dulles International Airport in Washington, D.C. later that day. Over the course of the following five days, the opportunity for a never-before-seen event will transpire: the meeting of the original, and first, Space Shuttle orbiter Enterprise with one of her operational sisters. Following arrival on April 12, Discovery will be removed from the back of the SCA via cranes and lowered onto the ground at Dulles. Shortly thereafter, on April 15, Enterprise will be hoisted on top of the SCA in preparation for her ferry flight to JFK International Airport in New York. But Enterprise’s road to New York will begin long before April 2012. In mid-January 2012, Enterprise will be removed from display at the Air and Space Museum. From mid-January through mid-April, Enterprise’s display pods will be removed, she will be fitted with the standard ferry flight aerodynamic tailcone assembly, and a ferry kit will be installed on her. Following the arrival of Discovery on the SCA on April 12, Enterprise will be towed out of her temporary storage hanger to the SCA at Dulles, mated to the aircraft, and flown out of Washington, D.C. and into JFK International on April 17. After a month in storage, Enterprise will be demated from the SCA and await the readiness of the Intrepid to receive her. 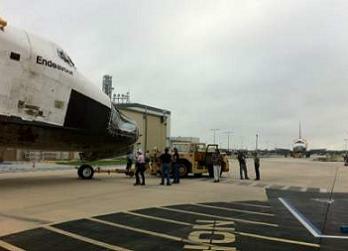 Following her move to the VAB today, Endeavour will spend the next two months in storage in the VAB. Once Atlantis/OV-104 is done with Down Mission Processing activities in mid-October 2011, Endeavour and Atlantis will swap places (just like Discovery and Endeavour did). Endeavour will be moved into OPF-2 (fittingly enough, her home) where she will be processed out for retirement. T&R processing on Endeavour will begin in mid-October 2011 with the start of OV-105/OPF-2 End State Safing – a time where all critical government equipment that cannot be permanently displayed with Endeavour will be removed. End State Safing of Endeavour will last from mid-October 2011 through mid-March 2012. Specific display site configuration work will take pace in January and February of 2012, and she will be configured per the wishes of the California Science Center. 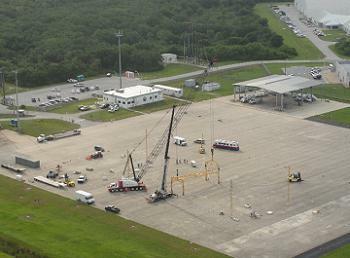 Installation of Endeavour’s RSMEs will be completed by early January 2012. 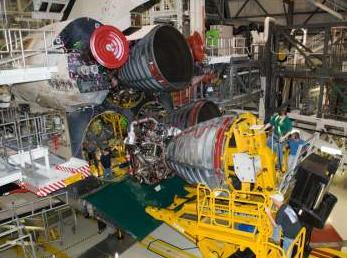 Then, in early-February 2012, Endeavour will be powered down for the final time. In late March 2012, Endeavour’s FRCS and OMS pods will be returned from White Sands Space Harbor. At this point, the second part of Endeavour’s two part display site ops configuration will take place with the installation of her FRCS and OMS pods. On this day, she will be removed from OPF-2 and moved to the VAB for storage in VAB HB4. After two months of storage, Endeavour will be towed to the SLF on August 2 and mated to the SCA. On August 4, 2012, Endeavour will leave the Kennedy Space Center for a brief cross-country tour before landing at Los Angeles International Airport (LAX). Once at LAX, Endeavour will be promptly removed from the SCA and lowered to the ground. Removal of Endeavour from the SCA will serve to mark one of the final “lasts” for the Shuttle Program: the completion of service of the Shuttle Carrier Aircrafts which have been in service since the initial taxi and Approach and Landing drop tests of Shuttle Enterprise in 1977. Delivery of Endeavour to Los Angeles will also mark the final time that a Space Shuttle orbiter will leave the Kennedy Space Center. 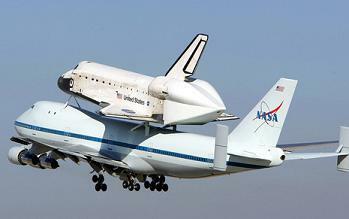 Coincidentally, Endeavour – the baby of the Shuttle fleet – was the last Shuttle orbiter to be delivered to Kennedy. She arrived for the first time on May 7, 1991. After completing Down Mission Processing from STS-135, Atlantis will be moved into VAB HB4 for storage in mid-October 2011. 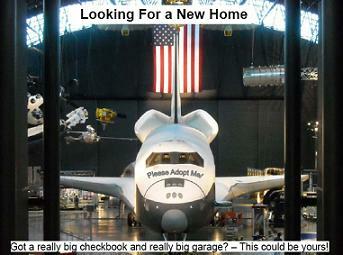 On January 3, 2012, Atlantis will swap places with a retirement-ready Discovery to take her place in OPF-1. Once in the OPF, T&R processing on Atlantis will begin right away with the start of OV-104/OPF-1 End State Safing. This End State Safing will take place on Atlantis from January to the beginning of May 2012. During this End State Safing phase, Atlantis will be powered-down for the final time in her career – marking the end of powered orbiter operations at the Kennedy Space Center for the time since the late 1970s. Atlantis’s FRCS pod and OMS pods will be shipped to White Sands Space Harbor for retirement safing and processing in mid-March 2012. In mid-May, installation of Atlantis’s RSMEs will be complete. Teams will then begin the two part process of configuring Atlantis for display. The first part of this processing will run from mid-May to mid-June 2012. The second part will resume with the return of the FRCS pod and OMS pods in early July and run through mid-September. Finally, on September 19, 2012, all processing work on Atlantis will be complete – an end of over 30 years of Shuttle processing efforts at the Kennedy Space Center. 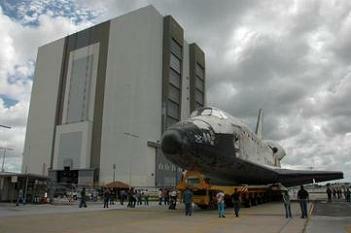 On Sept. 19, Atlantis will be removed from OPF-1 and stored in the VAB until February 2013. For the final time, on February 1, 2013 – exactly 10 years after the loss of Columbia – Atlantis will be rolled out of the VAB, past the OPFs, out onto State Road 3, and down the road to the KSC Visitor’s Center. (Images: Via L2 and L2 presentations, NASA.gov and Omar Izquierdo via twitter (@izqomar. Further articles on the fleet will be produced during her down processing, driven by L2 – which is continuing to follow the orbiters via a wealth of FRR/PRCB/MER/MMT and SSP documentation/pressentations, videos, images and more.